Have the girls and boys who have been working hard to make Smart Energy happen been good this year? Will Santa bring them what they want? It’s looking less than likely. Despite promises that specifications would be complete, progress has inevitably slipped. What’s worse, the elves in some of the utilities didn’t pay attention to the lists the boys and girls stuck up their chimneys last year, and instead of sending them energy savings, it turns out that they actually sent them higher utility bills. Of course, things were never going to happen as quickly as projected, even with the amount of stimulus money being thrown at the companies involved. If anything that’s resulted in things slowing down as everyone has concentrated on scrabbling around for a part of the pie, insisting that their toys are better than anyone else’s, and that they deserves the biggest box under the tree. However, the story of the year is probably the level of consumer resentment that has built up towards smart metering deployments. Much of that seems to have been unnecessarily self-inflicted. In the Netherlands we’ve seen programs delayed because of privacy issues, and in the US there has been major customer resentment at higher bills. And that’s before we get into the ridiculous paranoia about the meters irradiating the population. It’s interesting to contrast what’s happening within the UK. Not only are they taking a lead in deployment of real smart metering, with British Gas’ decision to roll out 2 million gas and electricity meters. There’s also the UK Government’s highly detailed consultation and a growing level of consumer education. It will be interesting to see whether that results in more customer satisfaction, and a bigger change in energy usage? That level of up-front education may be the most significant initiative of all the Smart Energy deployments that are happening around the world. Over the last six month it’s been noticeable that utilities within the UK are playing a different game to their peers elsewhere in the world. They’re making strenuous efforts to tell consumers about the savings they can make and how they can achieve them. Most days, if you pick up a newspaper there will be an advert or advertorial promoting energy savings. In the last month that’s even started to extend to public advertising. 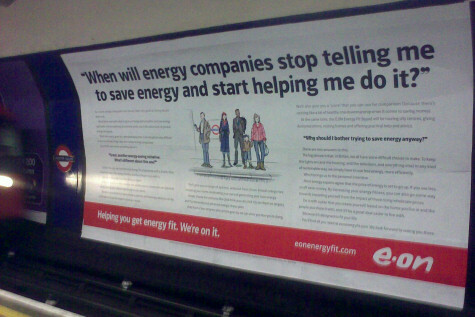 As I was waiting for a tube train, I was faced with a billboard sized poster from https://www.eonenergy.com/At-Home/Products/EnergyFit/, asking “When will energy companies stop telling me to save energy and start helping me to do it?” It’s a good question, and one they’re keen to help answer. Once you’re on the train, a smaller version of the same advert emphasises the message. Eon is not alone. Scottish Hydro has been actively promoting energy meters and displays with their new iPlan product. It uses a smart display from Onzo to provide relevant information and web based analysis to its customers to help them interpret and act on the information. It’s still a bit techy, but it’s firmly putting across the message that the utility can help you save money. That approach has been a consistent part of the message here in the UK. There’s currently no talk about load shedding, mandatory demand shifting or Time of Use Pricing. Instead it’s a far more inclusive message about understanding how you use energy, along with suggestions of how to reduce that usage. It’s all about nudging rather than battering over the head and appears to be working in that consumers are going out and asking for smart energy monitors. We’ve even had a Smart Energy Week, although I’m not sure that many people noticed. It was a bit like the twelve buzzwords of Christmas rolled into seven days and probably more for the benefit of the industry than the consumer. Joel Hagan has provided a suitably critical review. The message for the organisers is to think a bit harder next year. On the other hand, I was very encouraged to see the Government consultation document recognises the same need to engage the customer, with its excellent mandate that In Home Devices (IHDs) must display energy usage as a real, monetary cost, rather than hiding behind scientific units of kWhr or BTUs (British Thermal Units, which always sounds like some kind of winter underwear). It’s good to see a document at this level understand the importance of engaging with the consumer, rather than just preaching at them. Which is all very encouraging. It will be interesting to compare the uptake and the effect on consumer behaviour from this level of promotion and education. After all, if the industry is to make Smart Energy work, it needs to persuade consumers that it is worth their while saving energy. For the average consumer, the easiest thing is to maintain the status quo, until that become financially unviable. It is going to be very difficult to change that everyday behaviour – probably far more difficult than the technical challenges of designing, building and deploying Smart Energy products. But unless we do that, the only option will be the big coercive stick of grotesque pricing or mandatory appliance control. Neither of which is a desirable goal. However, coming back to the Christmas theme, my prize for the best consumer innovation in Smart Energy has to go to Geo Energy Monitoring. They’ve already supplied over one million energy monitors to customers in the UK. They’ve worked with them to help persuade their employees to act as guinea pigs and use the energy monitors. That the employees realise what energy saving is all about, which makes them excellent ambassadors for the technology. Taking that approach one stage further, they’re now offering corporate branded energy monitors as gifts for employees and staff. I know it’s not the same as receiving a bottle of wine or a turkey, but I hope that some companies see the benefit of promoting energy savings and take them up on the offer. And even if they don’t do it for Christmas, I still reckon it’s a far better corporate gift than the usual stuff that gets handed out. So if you’re a Marketing Director looking for a replacement for personalised Christmas cards or executive toys, have a look at their offer at http://www.greenenergyoptions.co.uk/corporate-gifts. If nothing else, it might help your customers or employees save a few pounds after their Christmas excesses. You never know – it might even replace the mistletoe as the place to sneak that surreptitious, self satisfied Christmas kiss. And where better to promote your brand than that? Onzo is in fact doing something similar called PeoplePower, which is a corporate challenge. Each firm’s employees that take on the challenge will receive a slick Onzo PeoplePower Kit to enable them to learn and improve their energy consumption at home and most of all lower their bills. Staff will compete on there own at home and in groups to reduce their home energy usage with help from Onzo’s home energy display and integrated web service. When employees upload their data at home, Onzo’s intelligent software will update the PeoplePower league tables their company’s results website. The competition between teams will bring the staff together and share observations and energy tips. I’m not quite sure it could replace the mistletoe at Christmas, but I’m sure it will bring out the green hero’s in people.